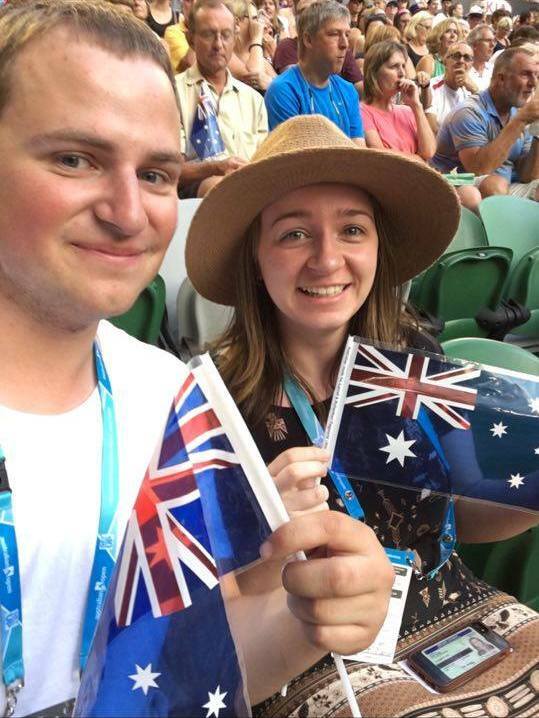 Hi everyone, my name is Mitch (@carnesy56 on Twitter) and I wanted to take this opportunity to record some of the experiences I had at the 2016 Australian Open as a staff member and as a patron. I have now worked at four separate Australian Opens, starting from 2012 (I missed 2014) and have really enjoyed each year for so many different reasons. My role at the Open is to provide information to patrons, whether that is information relating to tickets, scores, practice schedules or directions. 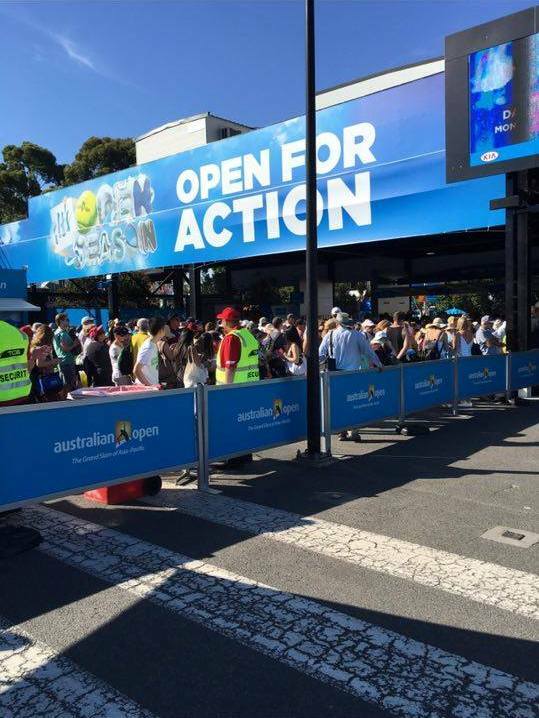 Working at the Open allows me free entry to all outside courts, excluding Margaret Court Arena and Rod Laver Arena for which tickets are sold separately. I am also entitled to a meal allowance each day from the Staff Cafe, and I also receive two free ground passes and a program. I usually try and see as many matches as possible when I am not scheduled to work. My first shift at the Australian Open this year was actually in Federation Square on the Sunday before the Open. This is located right in the centre of Melbourne CBD and is about a five-minute walk from Melbourne Park. I always love working in this spot because so many tourists come up to our booth and are from different parts of the world. I met fans from Germany, Poland, Japan and the UK all wanting to see their star player in action. I lost count of the number of Japanese fans asking where Nishikori was, or where he would be playing. A lot of international fans are really proud of their local players, and I always enjoy talking tennis with them. Following the tour so closely really gives me an advantage in this area as I find it very easy to connect with people. My shifts during Week One of the open were extremely busy. I was located both inside the grounds and outside the grounds. I also was able to meet a couple of other tennis fans that I’ve gotten to know on twitter. I think my bright yellow attire made me quite easy to spot. One twitter friend I met, Lesley, had flown down from Queensland to watch the Open. It’s always gratifying to share tennis experiences with people who love the game as much as me. 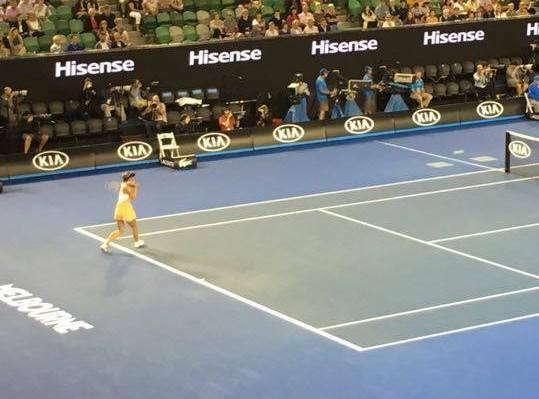 The first live match I saw was between Maria Sharapova and Nao Hibino on Margaret Court Arena on the first Monday night. I was quite excited to see Sharapova as she has become one of favourite players to support. It’s hard not to admire her professionalism and her dedication to each and every point. 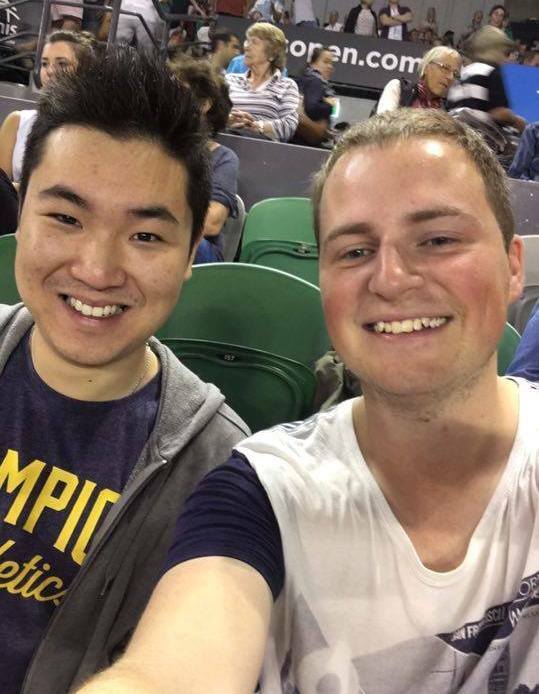 I went to this match with my brother who lives in Melbourne. I was quick to inform my brother that Hibino was indeed a Tashkent Champion and shouldn’t be overlooked, but I fear my enthusiasm fell on deaf ears. Sharapova had not played since Singapore last year but did not look troubled at all. She cruised in the first set to win 61. In the second set, Hibino started to play better, but Sharapova still looked in control. Sharapova would go on to take the match 61 63. Hibino did save a couple of match points but could only look on as Sharapova fired a return winner to clinch the match. I found the match really entertaining to watch as I enjoy watching Maria’s fearsome game and her attitude never wavers, despite the scoreline. 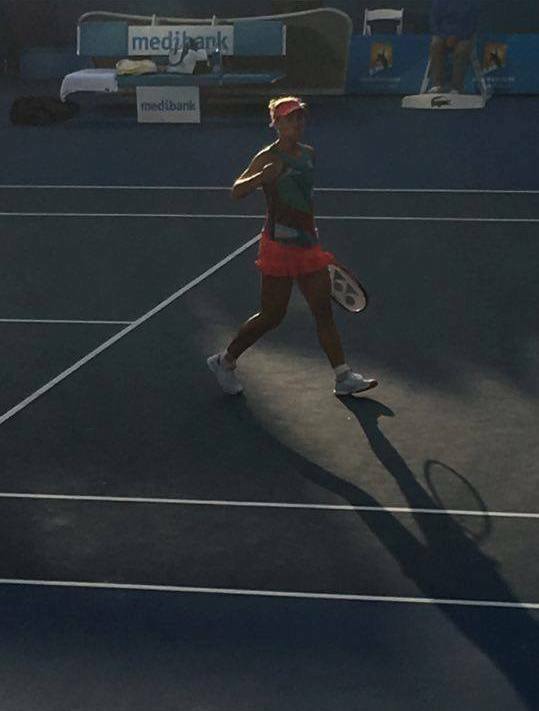 I was most excited to finally see my favourite tennis player, Angelique Kerber, play a match that she might be able to win. I had been unfortunate to see her lose to Makarova in 2013 and Pennetta in 2014, so I was really hoping this year might be the year I saw her win a match. Prior to the draw being made, I remember talking to Robin (@GermanTennisFan on twitter) and hoping Kerber would draw either Hradecka or Doi in round one because after Kerber’s 2015 Australian Open ended on the first Monday, I really just wanted her to win a round. When she drew Misaki Doi (who she had incidentally destroyed 60 61 in Toronto last year) I felt quite optimistic. Fortunately, I had the first Tuesday off, as did one of my friends in my team, so we went to Show Court 2 and got in just as Isner was defeating Janowicz with a characteristic ace. I decided to attend with a German flag to show my support and sat close to Kerber’s box. Kerber started the match well, using her consistency and deep angled groundstrokes to race out to a 40 lead. I started to think this might be a quick match. How wrong I was. Doi rattled off five straight games with some brilliant forehands and Kerber was starting to look anxious. Doi would claim the first set in a tiebreak. The second set was much the same as the first, except my cheering became much louder. I was even fortunate enough to get some stares from some Japanese fans in front of me (I always think it’s a job well done if your support earns you pointed stares). Kerber was up 52 and had three set points in a row on return, but Doi sprang into action and rattled off three straight games to get back to 55. Inevitably, we came to a second set tiebreak, and I definitely feared the worst. Eventually it came to Kerber serving at 56 in the tiebreak to stay in the match. I turned to my friend and said “this return just HAS to go long, otherwise it’s over”. Thankfully for me, Doi’s forehand return sailed long and Kerber saved the match point and was able to claim the next two points of the tiebreaker and take it 86. The third set was very close with both players really fighting hard. 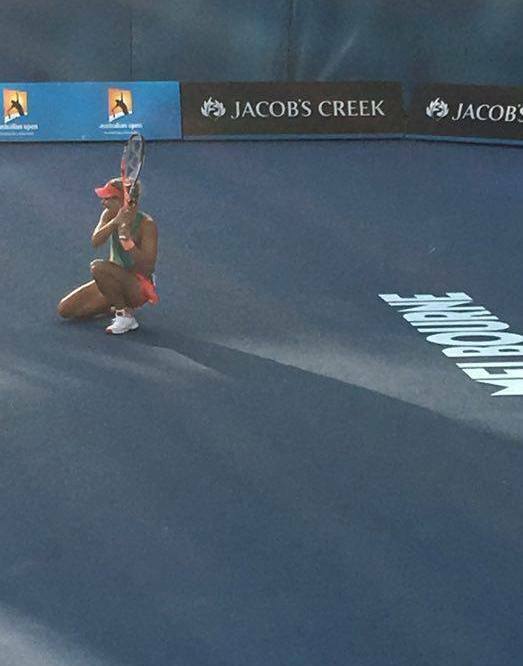 Eventually Kerber broke to go ahead 32. Again, it looked like Kerber would rush through the final few games but Doi had 0-40 again when trying to break back at 43. Kerber hung on in what turned out to be the penultimate game, and managed to break at love in the final game with one of her trademark forehand return winners down the line and I got my wish that Kerber would make it to Round Two. It was such a great atmosphere on Show Court 2 and both ladies put on a hugely competitive and enthralling match. I decided to have a look on the Ticketek app on the morning of these matches as I really wanted to see Lleyton Hewitt play for one final time. I managed to find two seats quite close to the front and I convinced my friend, Laura, to accompany me. I am more of a fan of women’s tennis but I have enjoyed watching Lleyton play over the years and have been grateful for all he has done for Australian tennis. It was quite clear from the outset that James Duckworth was not going to spoil the party. Hewitt was just a touch better in all areas, and he managed to win 76(5) 62 64 to advance to the second round. There was a lot of appreciative applause for Hewitt as there was an air of finality about this match. Hewitt would go on to lose to Ferrer in straight sets in the second round. I was grateful to see Lleyton win one final time as I had seen him play many times over the years. 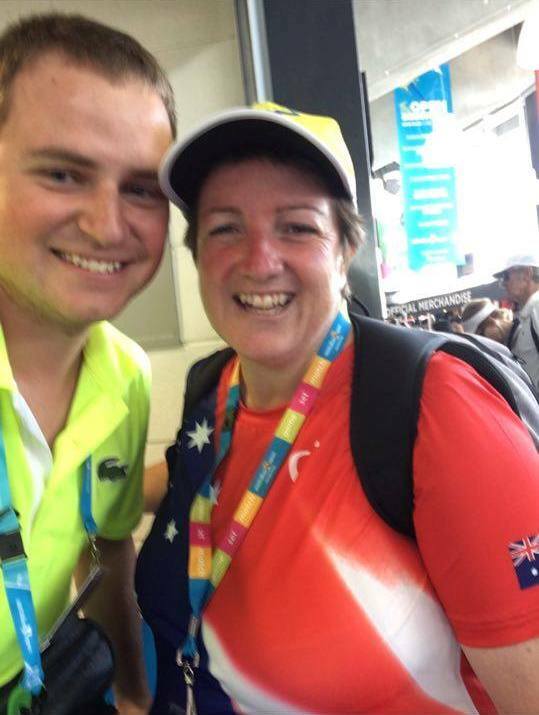 The next match was between an in-form Victoria Azarenka and a young Belgian whom I met in Hobart a couple of weeks prior to the Open, by the name of Alison Van Uytvanck. It was clear from the outset that Azarenka was in no mood to be out on court long. I couldn’t help but laugh when Azarenka motioned to the ball boy three times for her towel. She looked most frustrated. Clearly, it was a late night for everyone. Fortunately for Azarenka, that was the most distress she faced, as she completed a demolition job of Van Uytvanck 60 60. I must say that Van Uytvanck had been most unlucky with her Australian Open draws (she drew Serena Williams in 2015). Maybe she will be more fortunate in 2017. I did not get to see the entirety of this match as it began just as I was completing a shift but it definitely was a highlight for me. Puig was trailing a set and I managed to get into a crowded Court 8 as she entered into a second set tiebreaker. Pliskova was serving exceptionally well and would go on to serve a WTA record of 31 aces in this match. As she strangled the life out of Puig to lead 63 in the tiebreak, I felt this would be an early night. Puig proved me wrong with some inspired tennis to take the next five points and level the match. I was reminded of the match between Li Na and Kim Clijsters I saw live back in 2012 when Kim rallied from a set down and 26 down in the tiebreaker to force a third. 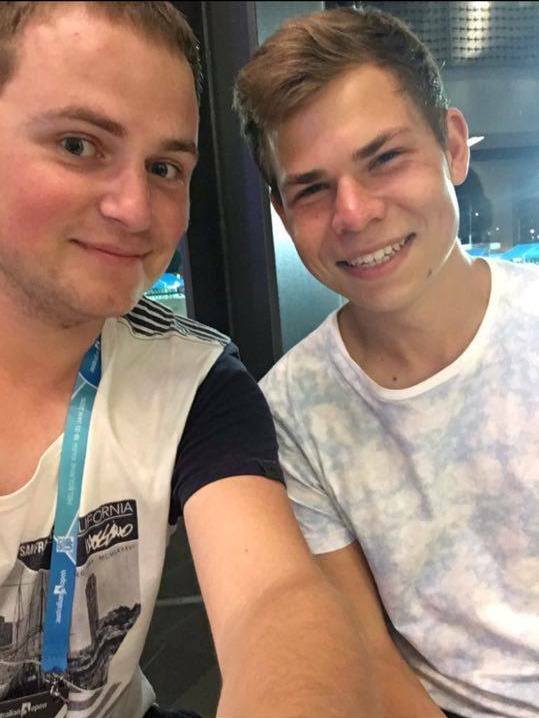 I was able to find a friend I knew through Twitter to sit with for the deciding set, Tom (@TennisZealot). We hoped to see Puig complete her comeback. Tom had just seen a lot of Puig during the Sydney International. Given her rich vein of form, Puig was playing with confidence but was having difficulty reading Pliskova’s serve. As the third set progressed, it was approaching 10pm local time, and the stands had completely filled to create an exciting atmosphere. 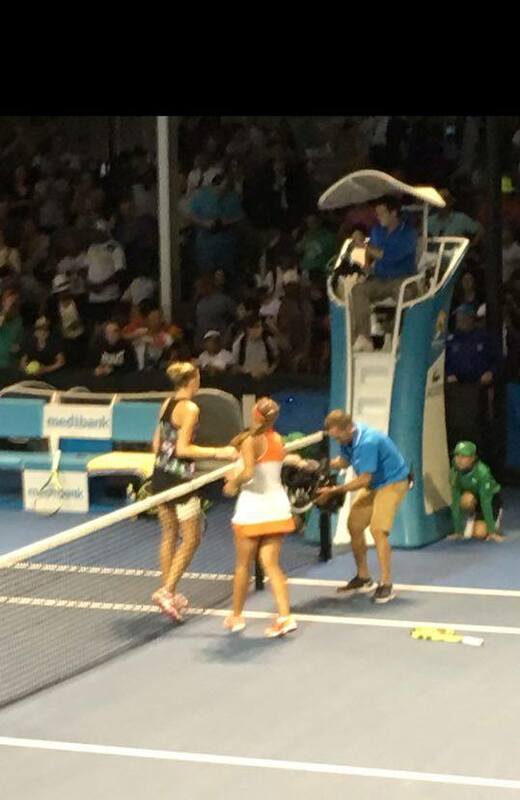 Chants of Mo-ni-CA were punctuated by a few fans behind us screaming for Kristyna to ‘lift’. Puig was serving second, which can be a disadvantage in a deciding set if both players continue to hold. Puig managed to save a further two match points before arriving at break point after 14 straight holds in the third set. She managed to convert the break point before serving out the match after 2 hours and 20 minutes. I loved this match as Puig showed tremendous heart and fight to battle her way out of such a bleak situation. This match epitomised how unique grand slam tennis is, and how much more is at stake, which is reflected in the players’ intensity. I always try to ensure I have the first Sunday off from work at the Open so I can see a full day session of the fourth round at Rod Laver Arena. I had organised to go with three of my friends, including one I had made on twitter, Kings (@aussiesharapova). As you can tell by his twitter handle, he is quite a Sharapova fan, and sure enough, the first match scheduled was Sharapova v Bencic. I was glad he would get to see his favourite player! The weather was quite drizzly and so we were fortunate enough to see some indoor tennis. The roof shutting created such a unique atmosphere, and the conditions seemed quicker. Both the seeds had held to form and it was exciting for me to see a match-up of players that are both in the top 15. I was quite happy to see a match indoors as this was quite a rarity in Melbourne. Bencic started well and managed to take a 32 lead in the first set, but Sharapova broke right back in the sixth game. Eventually Sharapova would claim an extremely tight first set, 75, on her third set point. In the second set, both women served terrifically, especially Sharapova. She managed a career-best 21 aces by the conclusion of the match. Both players traded winners and after 11 games, Sharapova lead 56 on serve in the second set. Bencic fought hard but fell just short. On the last point Sharapova hit a winner that was called out, but she challenged and the decision was over-turned and she had won the match. I always enjoy the added addition of Hawk-Eye to tennis matches. It really gets the crowd involved. Sharapova moved through to the quarter finals with a 75 75 win over Bencic. I wasn’t quite as invested in the second match between Serena Williams and Margarita Gasparyan. Williams was quite ruthless in winning the contest 62 61 in just under an hour. The final match of the day session was between Novak Djokovic and Gilles Simon. Djokovic was deservedly a heavy favourite to win at Melbourne Park for the sixth time. His defensive skills and sheer athleticism seems to win him match after match. I think most of the crowd, me included, assumed this match would be over in 3 close sets. Simon had made a name for himself for grinding out long tennis matches. Djokovic managed to take the first set 63 and got to a second set tiebreaker. Surprisingly, Simon played a great tiebreaker to level the match with sheer consistency. Djokovic’s error count continued to mount alarmingly as the pair traded sets three and four and we headed into a fifth and deciding set. Djokovic started to clean his game up and looked the stronger player at the end of the 4 and a half hour contest and ran out a 63 67(1) 64 46 63 winner. Djokovic managed over 100 errors and still won the match which, in my opinion, is extremely difficult to do. I liken it to the creative ways Stosur continues to lose in Australia. Not easy. 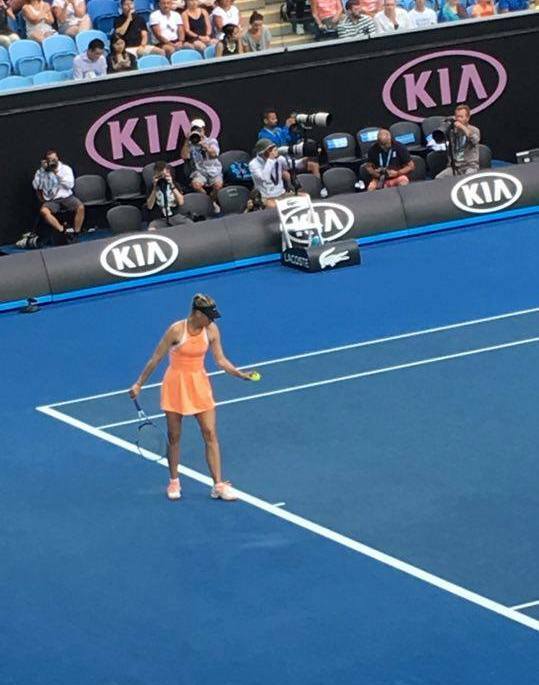 April 19, 2016 in ATP, Australian Open, Guest Post, WTA.